A great article from Elizabeth Burr, highlighting the dire situation of Palestinian Christians in particular. In truth, most ‘Western’ Christians fail to even realise that there are Christians in Palestine suffering alongside their Islamic Palestinian sisters and brothers. The statements she quotes by church leaders though at the end of the article suggest that the ignorance cannot last forever. From America Magazine (The only national Catholic weeklyin the USA). Recently I asked Dominique Najjar, a Palestinian Christian who lives with his wife and children in Minneapolis, why so many Palestinians are leaving Palestine. He told me the story of how he and two of his three brothers, all aspiring professionals, immigrated to the United States from East Jerusalem out of “economic necessity,” starting in the early 1970s. “My parents needed support,” he said, explaining that economic advancement was impossible under Israeli control. This took place within the first decade of the Israeli military occupation of the West Bank, including East Jerusalem and the Gaza Strip, which began after the 1967 war and is illegal under international law. It is difficult for citizens of other countries to appreciate what the occupation means for Palestinians who are not citizens of the country that rules them (unlike Israeli Palestinians who live in the recognized State of Israel). A reading of the 30 articles of the United Nations’ Universal Declaration of Human Rights (1948) reveals that very few of these rights are applied to occupied Palestinians. Directly relevant to Mr. Najjar’s story, for example, Article 13 (2) states, “Everyone has the right to leave any country, including his own, and to return to his country.” People of conscience are faced with the oppression of an indigenous population in their own homeland, and Christians worldwide must confront the truth that Palestinian Christians are walking down a long Via Dolorosa from which, without international intervention, the only exit is exile. Indigenous Christians have lived in Palestine since the origins of Christianity about 2,000 years ago. Over the centuries other Christians immigrated to Palestine. Palestinian Christians comprised at least 15 percent of the Palestinian population in the late 19th century, under Ottoman Muslim rule, and about 7.5 percent by 1944, in the final years of the British Mandate. During the 1948 war, which resulted in the establishment of the State of Israel in much of historic Palestine, more than a third of Palestinian Christians were among the 750,000 to 800,000 refugees forced to flee their homes in Palestine. The Israeli historian Ilan Pappé has described Israel’s “war of independence,” which Palestinians call the nakba (catastrophe), as “the ethnic cleansing of Palestine” in his book by that title published in 2006. Audeh Rantisi, a Palestinian Christian, has written in The Link, a journal published by Americans for Middle East Understanding, about his family’s expulsion from Lydda, near Tel Aviv, in July 1948, along with that of thousands of other residents. An 11-year-old at the time, Rantisi witnessed: an infant being crushed to death by a cart after his mother lost hold of him, an Israeli soldier shooting to death a newly married young man who would not hand over his money, people dying of thirst and many more horrors. He reports that “scores of women miscarried, their babies left for jackals to eat.” On the fourth day of the “Lydda death march,” his 13-member family reached Ramallah, in the West Bank, “carrying nothing but the clothes we wore.” His father also took with him the key to their house. Generations of the Rantisi family had lived in Lydda for some 1,600 years. Mr. Pappé is not alone among scholars who have identified a Zionist ideology of exclusion as the engine driving the expulsion of Palestinians in 1948 or who have interpreted Israeli policy since then as a continuing campaign of ethnic cleansing. By 2011 the Israeli occupation of the West Bank and Gaza Strip had reached its 44th year. In the West Bank, including East Jerusalem, the occupation has brought the construction of scores of “settlements” in violation of the Fourth Geneva Convention, which currently house at least half a million Israeli settlers. Five years ago Israel had already expropriated 87 percent of East Jerusalem and 75 percent of the West Bank for settlements, parks and military areas. Thus less and less Palestinian land is available for Palestinian housing, agriculture or other uses. Human rights abuses of Palestinians abound under the occupation, which appears designed to make their lives so unbearable that they will “voluntarily” leave. The emigration of Palestinian Christians from the occupied territories to the West since 1967 has also reduced their number to the point where Christians currently account for less than 2 percent of the Palestinian population under occupation. And the rate of population growth for Palestinian Christians in the West Bank amounts to just half of their emigration rate. Without a stabilization or reversal of the net decline, the extinction of Palestinian Christians in the territories is conceivable. Even in 2006 only about 50,000 Palestinian Christians were living in the West Bank and Gaza. What explains the ongoing exodus of Christians from Palestine? Some attempts at an explanation are misleading. In line with the Islamophobia notable in Europe and in the United States, Israeli propaganda points to tension and conflict with Palestinian Muslims, who comprise more than 98 percent of the Palestinian population under occupation, as the key reason for Palestinian Christian emigration. Israel has long encouraged political and religious division among Palestinians. Yet when I interviewed the Christian Palestinian secretary general of the East Jerusalem Y.W.C.A. in June 2009, she said that relations between Palestinian Muslims and Christians have been and remain largely positive. In her view “religious extremism” has been fostered by the environment of stress, chaos and conflict produced by the Israeli occupation. Indeed, there is a long history of good relations between Palestinian Muslims and Christians. Palestinians of both faiths experienced the catastrophe of 1948 together, and since 1967 those in the West Bank and Gaza have experienced the catastrophe of the Israeli occupation together. Palestinian Christians have tended to be well educated, relatively advantaged economically and more likely than their Muslim counterparts to have contacts in the West. Those could be considered “pull” factors behind the Palestinian Christian exodus. The “push” factors are the economic, political and social consequences of the Israeli occupation, with its “apartheid wall,” checkpoints and segregated road system; its ever-expanding settlements, destruction of Palestinian agriculture and demolition of Palestinian homes; its lawless, weapon-toting settlers; and its incarceration, with systematic torture, of thousands of Palestinians. A 2006 survey of Palestinian Christians conducted by the Palestinian Christian peace organization Sabeel confirms the decisive influence of these “push” factors. Romell Soudah, a faculty member in business administration at Bethlehem University, a Catholic institution, writes that “the continuous confiscation of land…coupled with restrictions on mobility and access, give the impression that people are living in a cage, dehumanized, with little hope for freedom and normal living. This situation…is the primary factor…forcing Christian Palestinians to leave.” These Israeli actions, plus water confiscation and economic strangulation, which drive unemployment and poverty levels upward, are seen as calculated means of emptying the land of Palestinians. Thus Christian Palestinian emigration is the most visible effect of Israel’s deliberate, if gradual, ethnic cleansing of the Palestinian population. Why should Americans care if Palestinian Christians in the West Bank are leaving their homeland twice as fast as their population there is growing? The erasure of native Christians from Palestine should be unthinkable. Palestine is where Christianity originated, and Palestinian Christians have a unique status in the worldwide Christian community. Americans should be outraged that U.S. policy, buttressed by generous funding from their tax dollars, makes possible the Israeli occupation and its discriminatory policies. These policies include a campaign to revoke the time-honored tax-exempt status of Christian churches and other Christian institutions, like the Lutheran Augusta Victoria Hospital on the Mount of Olives, and prohibition of access to holy sites (for example, barring West Bank Christians from visiting the Holy Sepulcher, traditionally regarded as the burial place of Jesus, in Jerusalem’s Old City). Orthodox Jewish harassment of Christian clergy in the Old City is commonplace. Hanan Chehata, a journalist, reports that “numerous churches have been destroyed during Israeli military incursions, divided from their congregations by the wall, and exposed to dilapidation.” Bethlehem’s Church of the Nativity suffered physical damage during the Israeli incursion and siege of 2002. The wall now encircles Bethlehem, separating it from nearby Jerusalem; residents of Bethlehem are prevented from entering Jerusalem and vice versa. A majority of Bethlehem’s Christians hold Israel responsible for the departure of record numbers of Palestinian Christians from their city. Yet Western Christians often fail to recognize the imperiled existence of their Palestinian co- religionists. Moreover, there are millions of Christian Zionists whose interpretation of New Testament prophecies allies them with Israeli Zionism and against the Christians of Palestine. They imagine that there is serious division between Palestinian Muslims and Christians, whereas the far more prevalent tension is between Palestinian Christians and some Israeli Jews (settlers, military and government leaders or those who represent them). The continued presence of Palestinian Christians in Palestine offsets the misperception that the “Israeli-Palestinian conflict” is really about relig ion—a conflict between Muslims and Jews, rather than one about land, human rights and international law. A Palestinian Christian friend wrote to me recently regarding the typical pattern of Muslims and Christians working together cooperatively and harmoniously within Palestinian institutions and organizations. Among the examples she mentioned is the Rawdat El-Zuhur (Garden of Flowers) elementary school in East Jerusalem, which has a Christian principal, a Muslim accountant, a mixed teaching staff and a mixed student body. Rawdat El-Zuhur, she wrote, “serves the community irrespective of [the members’] faith.” Likewise at Birzeit University, north of Ramallah, the president is Muslim and the chairman of the board is Christian; the board members are mixed, as are the staff and the student body. Elizabeth G. Burr, who teaches part-time at Metropolitan State University in St. Paul, Minn, has been concerned with the Israel-Palestine issue for more than 40 years. Tags: israeli military occupation, occupation, palestine solidarity. Filed under israel and palestine articles by Father Dave on Mar 10th, 2012. Comment. Should the US Go To War for Israel? Israeli Prime Minister Benjamin Netanyahu spoke to the annual AIPAC conference earlier this week. He also held a private meeting with US President Barack Obama. In his AIPAC speech, Netanyahu evoked the Holocaust as the source of Israel’s special privileged status that permits Netanyahu to do whatever he decides to do to “control Israel’s fate”. That, of course, includes bombing Iran’s nuclear facilities. 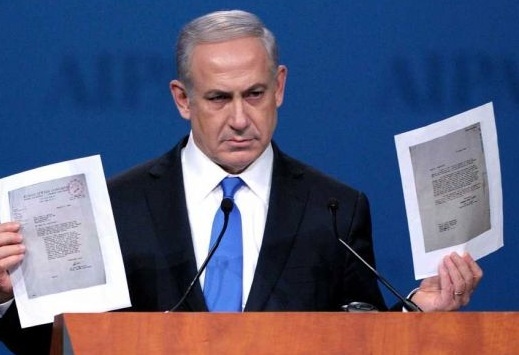 Netanyahu got out copies of two letters he said he keeps in his desk, between the World Jewish Congress and the War Department in 1944, when the WJC called on the United States to bomb the extermination camp at Auschwitz, and the War Department refused. Tags: AIPAC, minister benjamin netanyahu, War. Filed under israel and palestine articles, israel and palestine conflict by Father Dave on Mar 12th, 2012. Comment. The great Uri Avnery, founder of ‘Gush Shalom’ (the Israeli ‘Peace Bloc’), has persisted in saying that Israel will NOT attack Iran – not now and not ever! I pray to God that he is right. The United States will not attack Iran. Period. The United States will not attack. Not this year, nor in years to come. For a reason far more important than electoral considerations or military limitations. The United States will not attack, because an attack would spell a national disaster for itself and a sweeping disaster for the whole world. “If you want to understand the policy of a country, take a look at the map,” said Napoleon. Minutes after an attack is launched, Iran will close the Strait of Hormuz, through which passes almost all the oil exported by Saudi Arabia, the United Arab Emirates, Kuwait, Qatar, Bahrain, Iraq and Iran – 40% of the world’s sea-borne oil passes through the strait. A few minutes after that, oil prices will rise, will double, triple or quadruple – and the U.S. and global economy will collapse. Such small issues do not cross the minds of generals, military commentators and other wise guys who look at the world between narrow “security” blinkers. Closing the Strait would be the most easy of military operations. A few missiles, launched from either the sea or the land, would do it. To reopen it, it would not be enough to send the US Navy’s mighty aircraft carriers on show cruises. The United States would have to conquer large parts of Iran, so as to put the Strait out of range of the Iranian missiles. Iran is larger than Germany, France, Spain and Italy combined. It would be a long war, something on the scale of the Vietnam War. For Iran, there is no difference between an Israeli attack and an American attack. They would be treated as one and the same. In both cases, the consequence will be the blocking of the Strait and a large scale war. All of which is more than enough for the United States not to attack, and to forbid Israel from attacking. It’s 56 years since Israel went to war without giving notice to the Americans and getting their consent. When Israel did this in 1956, President Eisenhower took away all the achievements of victory, to the last millimeter. Before the Six Day War and on the eve of the First Lebanon War, the government of Israel sent special envoys to Washington to ensure unequivocal consent. If this time it did attack against the Americans’ will, who would restock the IDF armories? Who would protect the cities of Israel, which would be exposed to many tens of thousands of missiles from Iran and its proxies? Not to mention the wave of anti-Semitism which can be expected to burst out once the American public finds out that it was Israel, and Israel alone, which brought upon them a national disaster. American diplomatic and economic pressure might be sufficient to stop the ayatollahs’ gallop towards the Bomb. It worked in Gaddafi’s Libya and is now happening in the North Korea of Kim. The Persians are a nation of merchants, and it might be possible to formulate a deal which would be worth their while. This is questionable, because a few years ago the Neo-Conservatives in Washington engaged in glib talk about how easy it would be to occupy Iran – which surely convinced the Iranians that they must acquire the ultimate weapon of deterrence. What would we have done in their place? Or rather, what did we actually do (according to foreign reports, etc.) when we were in their position? So what is going to happen? If no deal is reached, Iran will develop nuclear weapons. That’s not the end of the world. As has been pointed out by some of our more courageous security chiefs, this is not an existential threat. We’ll live in a situation of a balance of terror. Like America and Russia during the Cold War. Like India and Pakistan now. Not pleasant, but not too terrible, either. Iran has not attacked any other country in a thousand years. Ahmadinejad talks like a wild demagogue, but the Iranian leadership actually treads very carefully. Israel does not threaten any Iranian interest. Joint national suicide is not an option. Education Minister Gideon Sa’ar boasted, and rightly, that Netanyahu had managed to distract the whole world’s attention, away from the Palestinians and to the Iranian problem. A fantastic success, indeed. Obama in effect tells him: OK, go and play with settlements as much as you want, but please leave Iran for the adults. Filed under Israel and Palestine, map of israel and palestine by Father Dave on Mar 13th, 2012. Comment. Did Florida’s Legislature really endorse a one-state solution? Father Dave writes: This seems very bizarre to me! When our local council got involved in the BDS program, the Federal government told us not to meddle in issues that should be left to their Department of Foreign Affairs. It seems that US states have no such inhibitions! But this bill seems to be a double-edged sword for those who created it! Did Florida’s Legislature endorse a one-state solution and Israeli citizenship for Palestinians? NEW YORK (JTA) — The Israeli-Palestinian conflict is a hotly debated issue — but not in the Florida Legislature. Both houses of the state’s Legislature voted unanimously in February to stake out a bold position on the issue — but it’s not entirely clear what, exactly, Florida lawmakers were trying to say. The activists behind the measure say their goal was to affirm Israel’s right to determine what happens with the territories it captured in 1967 and the right of Israeli settlers to live anywhere in the West Bank and eastern Jerusalem. But critics counter that the plain reading of the resolution ends up endorsing a one-state solution to the Israeli-Palestinian conflict — with Palestinians in the West Bank being granted equal citizenship. Such a prescription not only contradicts the stated policies of both the U.S. government and Israeli Prime Minister Benjamin Netanyahu, it represents what leaders in both countries have described as an existential threat to Israel’s existence as a Jewish democratic state. Supporters of the measure, however, denied that this was their intent. “One law for all people — and by ‘all people’ we mean Israeli citizens,” said Joseph Sabag, executive director of the Florida chapter of the Zionism Organization of America, who helped organize lobbying efforts in Tallahassee to get the measure adopted. Asked about suggestions that the text of Florida’s resolution seems to call for a one-state solution, one lawmaker said the reading did not occur to him. The Florida resolution is largely based on legislation that was approved unanimously by the South Carolina state House of Representatives last June. At a January meeting in New Orleans, the Republican National Committee embraced a resolution identical to the one passed by the South Carolina lawmakers when it was proposed by a committee member from the state. An RNC spokesperson later stressed that the resolution does not bind the party since it is not part of its platform. The RNC’s action, however, raised a few left-wing eyebrows. “There is no interpretation possible other than that the RNC is also advocating complete Israeli annexation of the West Bank, including granting citizenship to the Palestinians living there,” wrote Mitchell Plitnick, a dovish blogger who first reported on the RNC’s action. But the author of the original South Carolina resolution said he was not calling for a one-state solution. Clemmons, whose resolution was a model not only for Florida but other states now considering similar measures, told JTA that he was inspired to draft the measure following President Obama’s speech last May in which he said that future borders between Israel and a Palestinian state should be based on the 1967 lines with agreed-upon adjustments. Clemmons, a real estate attorney from Myrtle Beach, says he regards the biblical claim to Israel as the “oldest recorded deed in history” and set out to draft a resolution that reflects this view. The reference to “one law,” Clemmons said, was intended to refer narrowly to Jewish building rights, which he believes should be no different whether the Jew in question lives in Tel Aviv or in the West Bank. Sabag said the ZOA took the South Carolina resolution’s language and “enhanced it” before sending it along to Florida legislators and the leaderships of both the Republican and Democratic national committees. The resolution, however, makes no mention of land use or development issues. According to Klein, there is movement to have similar measures adopted in Pennsylvania and Ohio — both states that, like Florida, are sure to be crucial battlegrounds in the November presidential election. Sabag said the resolutions “will be addressed and clarified” as they are taken up elsewhere. “It’s not in its final version,” Sabag said. The resolution is one of several items taken up by the Florida Legislature in recent weeks that has commanded Jewish attention. A bill that intended to combat the application of Islamic law was opposed by many in the Jewish community out of fear that religious divorces decided by a rabbinical court also might be invalidated. The bill failed to come to a vote before the legislative session ended last Friday. Also, a bill adopted March 1 allows students to deliver “inspirational messages” in schools, which critics decried as opening the door to school prayer. The Anti-Defamation League urged Gov. Rick Scott to veto the bill, saying the law is “unnecessary, divisive, and unconstitutional,” and would invite costly litigation. Tags: israeli palestinian conflict, measure, prime minister benjamin. Filed under Israel and Palestine, israel and palestine articles, israel and palestine conflict by Father Dave on Mar 15th, 2012. Comment. Amb. Michael Oren’s article, ‘Israel and the Plight of Mideast Christians,’ presents Israel as a tolerant, dove-like, and peaceful democracy. This is belied by the facts. I am one of those Palestinian Christians living inside Israel to whom Oren refers. At no time in my life have I ever felt the ‘respect and appreciation’ by the Jewish state, which Oren so glowingly references. Israel’s Christian minority is marginalized in much the same manner as its Muslim one or, at best, quietly tolerated. We suffer the same discrimination when we try to find a job, when we go to hospitals, when we apply for bank loans, and when we get on the bus — in the same way as Palestinian Muslims. Israel’s fundamental basis is as a racist state built for Jews only, and the majority of the Jewish population doesn’t really care what religion we are if we’re not Jewish. In my daily dealings with the State, all I have felt is rudeness and overt contempt. Oren’s statement that ‘The extinction of the Middle East’s Christian communities is an injustice of historic magnitude’ is outright shocking to anyone familiar with even the basic history of how Israel was founded. I would like to remind him and others that this founding expelled thousands of Palestinian Christians from their homes in 1948 and displaced them, either forcing them to flee across the border or making them internal refugees. The ethnic cleansing of Palestinians that comprised the founding of Israel is, too, an injustice of historic magnitude. A man living in a glass home — or a home stolen from Palestinians — should think very carefully before tossing stones. My cousin’s husband, Maher, is from Iqrith, a village a few miles from mine in the Galilee. His family, and all of Iqrith’s inhabitants, were expelled from their village in 1948 and Iqrith was razed to the ground by Israeli forces on Christmas eve, 1950, in a special ‘Christmas gift’ to its people. The timing of this destruction leaves one to wonder at the intended message. Maher was born years after his family took shelter in Rama, a village nearby in the Galilee. Today, he struggles with finding a place to build a house to live in with his wife and children. Israeli policies that severely restrict the building zones in Arab towns and villages result in land shortages impeding the population’s natural expansion. Limiting land to residents of the same town or village means that internal Palestinian refugees face severe housing discrimination. The return of people like Maher has been made impossible by Israel, which refuses to negotiate on the right of refugees to return to their homeland. If Oren is so concerned for Palestinian Christians, would he kindly give the green light for the return of Christian refugees from Iqrith, Bir’im, Tarshiha, Suhmata, Haifa, Jaffa, and tens of other Palestinian towns and villages that they were expelled from in 1948? The answer, I assure you, is no. Many of these refugees are living in refugee camps in nearby countries, where Israel and Oren are happy to leave them. The terrorists referred to in Oren’s statement that ‘Israel, in spite of its need to safeguard its borders from terrorists, allows holiday access to Jerusalem’s churches to Christians from both the West Bank and Gaza,’ are in fact Palestinian Christians living on the land that Israel has occupied — in flagrant opposition to all human rights charters — and from which it is refusing to withdraw its soldiers and illegal settlers. To applaud Israel for giving people permits to travel across what by law is their own country is the height of hubris. His claim that ‘In Jerusalem, the number of Arabs–among them Christians–has tripled since the city’s reunification by Israel in 1967’ fails to mention Israel’s relentless policies of cracking down on Jerusalem: building unending settlements; building a Separation Wall that slices right through the city, severing its families, neighborhoods and businesses and hitting hard at its Arab economy; seizing Arab lands and expelling families that have lived on them for generations; and revoking the citizenship of any Palestinian resident who travels abroad for too long. Imagine the outcry if an American citizen traveled abroad for two years and upon return discovered that his citizenship was revoked and that he had lost his American ID and passport. Israeli officials don’t care whether the Palestinians they discriminate against are Christian or Muslim. It is true that inter-religious strife is on the rise in a region long tormented by poor living conditions, for which the West bears significant responsibility having aided the region’s many dictators. Oren’s faux tolerance and crocodile tears over the plight of Christians fool no one. Were he serious, I would urge him to have a close look at Israel’s policies of occupation and racial discrimination. Fida Jiryis is a Palestinian writer from the Arab village of Fassuta in the Galilee. She is the author of the forthcoming book, ‘˜My Return to Galilee,’ which chronicles her return from the Diaspora to Israel. She can be reached at fida_jiryis@hotmail.com…. Tags: palestinian christians, palestinian muslims. Filed under israel and palestine articles by Father Dave on Mar 16th, 2012. Comment.